8th Dimension Comics & Games is Northwest Houston’s favorite friendly destination for all things related to comic books, tabletop games, and pop culture. Visit our shop in Copperfield, at the intersection of West Road and Highway 6 North. We carry a wide selection of comic books and tabletop games, plus RPG miniatures, apparel, and more. Visitors are invited to check out our dedicated game room, where we hold frequent events and organized play. Look at our Event Calendar for the latest news. 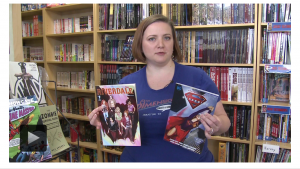 8th Dimension’s owners are longtime comics and gaming fans. Our goal is to create the comics and gaming store of our dreams – a fun, welcoming environment for everyone from lifelong fans to anyone who’s just curious about all this cool stuff and wants to learn more.